Yesterday buried under a fresh coat of snow, today a new optimism. Yes, I see the happiness! The happiness of wildflowers and small songbirds! Beautiful … just beautiful … wildflowers still seem a long way off … so thank you for this burst of happy. These are always the first to bloom here. It’s so good to see them, the few early ones! That’s a nice painterly background, I’d say Rembrandtesque. Some buttercups have been out in Austin for a couple of weeks. These are the first I’ve seen this year, but they are so welcome! Beautiful photo. Nice to see you back. It’s great to see it. I think it’ll be a week or two before we see anything like it here. We’re still breaking low temperature records. I hope you’re healing and can get around a little better. Your winter just lingers on! Our winter was hard, but spring is taking over now, just a few weeks later than usual. Yesterday I tried to drive to the nearest trail head, just to see what it was like, but a foot of ice on the road (and prudence) led me to turn around about a mile before I got there. A lovely sign of spring! Thank you! Yes, isn’t it good to see the optimism of nature starting to be displayed! Such a pretty sign of spring! Yes, it’s so good to see them again! The first I’ve seen! Way more than I have seen Terry great shot and find !! They are just starting now, about 2 weeks later than last year. Spring is just starting here Maria. March is a month of wild weather swings but a very exciting time. Wildflowers start to bloom, then get covered by new snow, then are in full sun again the next day. One of my favorite times! Gorgeous photo! Spring will NOT be defeated :)! Yes, it is happening! Our winter was harsh and long, but spring just can’t be stopped! Amen:)!!!!!!! I’m with y’all in spirit! I KNOW from living in harsh climes how these last few weeks can be excruciating:)! It’s coming with splendor on your beautiful land! I like the focus a lot. So you’re back to clicking the old shutter again? That’s great. Thanks Candace. I’m very rusty at the shutter, but it’s fun to start again. My posture is not very pretty though when taking pictures of the low growing flowers. I think I must look like something that fell off a truck, but it’s wonderful to be trying! This is the first flower I’ve seen this year too. There was snow the day before. The cycle of spring is starting, a little later this year. We’re nearly overrun with buttercups now. They’re everywhere, in greater profusion than I’ve ever seen. Maybe I’m just more attuned to wildflowers this year. They are beautiful – so sunny and springlike. I just laughed at the image of photographer-you, like a sack of turnips. Who cares? I suspect just being out there is worth it all! Isn’t it great to see the wildflowers start to appear! Glad you have lots this year! I’m sure there will be many new ones in your area. Here, there will only be a few for the next month, then there will be plenty. Yes, it’s very good to be outside and moving around a little just in time for spring! Hi Montucky, It is very exciting to get to see the new Spring flowers from underneath the melting snow. Beautiful! Have a tremendously nice weekend! Yes, year after year it’s always a fresh excitement, isn’t it! Have a great weekend, Linda! It is! 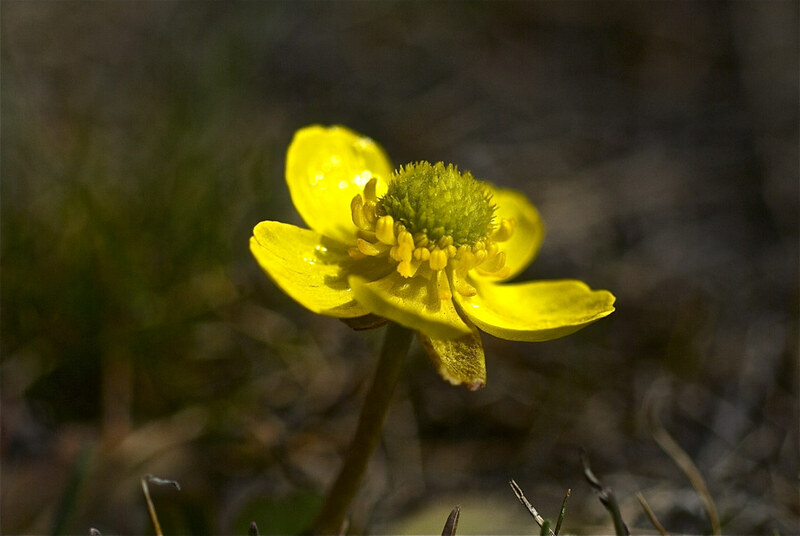 The little buttercup is so common, but so very welcome as the first of the wildflowers to bloom in spring. Good to have you back, and with a great photo of spring wildflower. Spring has sprung! Beautiful photo. Hope you are recovering well! Thanks Bill! Recovering, but it’s a very slow, painful process. Looking forward to summer when I can get on a few trails again. So lovely. Spring wildflowers are my favorite, because they bring hope. I love all of the wildflowers also for that reason. Most here are tiny but beautiful and display an attitude that greatly enhances my own! Great start Terry. Very beautiful photo. Thank you Matti. Spring here is developing slowly, which is perfect for me this year. During the next month the flowers will be a delight! Yes it is a start….courageous little flower! Yes, that species has the adventurers, but there must be a very successful strategy there because they are always numerous. The first buttercups in the spring are always very welcome. The sudden beauty and color of a flower after a gray and white season.